Some rankings of Maryland’s business climate put it at the bottom of the pack, as the Tax Foundation does. A few put it at the top, as does the U.S. Chamber’s #1 rating for innovation and entrepreneurship the governor likes to cite. And it is not unusual for Maryland to rank in the middle of the pack, as it does in a new Thumbtack-Kaufman Foundation survey of business friendliness. What’s different about the grade of C- Thumbtack-Kaufman gave Maryland, ranking it 27th in the U.S., is that the grade is based on a sample of 359 Maryland businesses from a national survey of more than 12,000 firms who use Thumbtack to connect with customers. Other rankings are often based on government or private data. The survey also claims to have no ideological agenda, other than a desire to “accurately convey the attitudes and concerns of actual small business owners,” in keeping with the Ewing Marion Kaufman Foundation goal of promoting entrepreneurship. A wide range of businesses — 80% in very small outfits of 1-4 employees in professional and nonprofessional services — responded to a simple 33-question online survey that took 5-8 minutes to complete. The questions, methodology and breakdown of results are all laid out in a 45-page report. Maryland got B’s on ease of hiring, labor regulations, and even an A+ on training and networking programs. But like many other business rankings, the state scored poorly on overall regulation, getting D’s on taxes, licensing, environmental regs and zoning. The survey also broke out the Baltimore metropolitan region, giving it similar scores on most issues. As often happens in these ranking, Virginia scored much better than Maryland, getting an A+ on overall friendliness, ranking it fourth in the nation, and getting A’s in most categories. The Washington metropolitan area did much better than Baltimore, combining as it does Maryland, Virginia and the District of Columbia. It’s overall score for business friendliness was A-. This is a major improvement from the first Thumbtack survey in 2012 when the D.C. area got a D+. It perhaps reflected a different mix of businesses from the three jurisdictions. 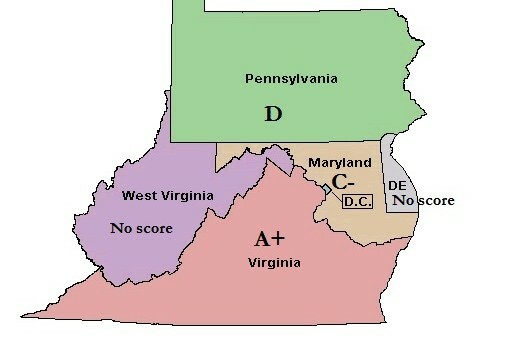 Pennsylvania got a score of D, getting D’s in most categories; Delaware and West Virginia were not ranked because they were among the 12 states that did not have enough survey respondents to score. The CEOs of Maryland’s major businesses have found the “elephant in the room” that stands in the way of economic growth here: the state’s non-competitive tax structure, according to a new report from the Greater Baltimore Committee.